Justice Babs Kuewumi of the Federal High Court in Lagos yesterday convicted the directors of the four companies allegedly used by former President Goodluck Jonathan’s senior special assistant on Domestic Affairs, Warpamo Dudafa, to launder $15.591 million. 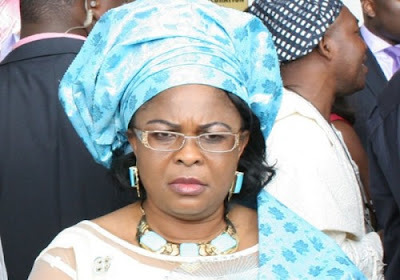 The sum involved in the case is the same money which former First Lady, Patience Jonathan claimed belongs to her as the sole signatory to the accounts of the companies. She, however, denied ownership of the companies. The directors of the four companies: Pluto Property and Investment Company Ltd, Seagate Property Development & Investment Co. Ltd, Trans Ocean Property and Investment Company Ltd and Development Company Ltd, had earlier pleaded guilty to the 15-count amended charge brought against them by the Economic and Financial Crimes Commission (EFCC). They were convicted yesterday after the EFCC counsel, Rotimi Oyedepo, reviewed the facts of the case. The companies’ directors, who were represented in court by Friday Davis, Agbo Baro, Kola Fredrick and Taiwo Ebenezer, and China John, accepted the facts of the case as presented by the anti-graft agency. The anti-graft agency had in August, arraigned Dudafa alongside a lawyer, Amajuoyi Briggs, a Skye Bank official, Demola Bolodeoku, and the four companies on a 15-count charge of conspiracy, stealing and money laundering. According to the EFCC, the accused persons had, between November 13, 2013, and May 28, 2015, conspired among themselves to conceal, through various banks in Nigeria, the sum of $15. 592,700 million, which they knew to be part of the proceeds of an unlawful act. The anti-graft agency also alleged that the accused persons committed the fraud with one Sombre Omeibi, now at large, through accounts number 2110002269, 2110002238, 2110002245, 210002252, 2110002207, 2110002269 and 0122493290, domiciled in Skye Bank Plc. The offences, according to the commission, are contrary to section 18(a) and 15(a) of the Money Laundering (Prohibition) (Amendment) Act, 2012, and punishable Under Section 15(3) of the same Act. The EFCC specifically accused Dudafa of having used the companies, which he allegedly incorporated through proxies, to perpetrate fraud. Mrs Jonathan had, in September this year, filed a fundamental rights enforcement suit at the Federal High Court in Lagos, where she asked, among other things, that the court should compel the EFCC to immediately remove the ‘No Debit Order’ placed on the accounts. While reviewing the facts of the case, Oyedepo informed Justice Kuewumi that Pluto Property and Investment Development Company Ltd, had between November 14 to 19, 2014, retained the sum of $1.940,500 million, $1.2 million, $1.340,700 million, $1895,400 million and $1.2 million in its account number 2110002207 and 2110002238 domiciled at Skye Bank. Oyedepo also said that Transoceanic Property and Investment Development Company Ltd d also retained in its accounts number domiciled with Skye Bank the sum of $1.897,700 million between February 21 and November 19, 2014. The lawyer further informed the court that Seagate Property and Investment Development Company Ltd also retained in its Skye Bank account number 2110002243 the sum of $1.839,900 million, while .Avalon Property and Investment Development Company Ltd retained $250, 000 in its account number 0122493290, domiciled with WEMA Bank Plc, on February 28, 2015. He further told the court that the said monies were proceeds of crime, and that they were paid into the four companies’ accounts by one Festus Iyoha, who was a domestic employee at the State House, Abuja. Oyedepo also informed the court that the said Iyoha had paid the monies into the companies’ accounts on the order of the first defendant in the case, Dudafa. Oyedepo also tendered some documents, such as the companies’ bank mandate forms, account opening packages and CAC’s Forms 2, which indicated that the purported directors are major shareholders in the companies. However, lawyers representing other accused persons, Gboyega Oyewole, Ige Asemudara and Joseph Okobieme, urged the court to allow their clients to go through the documents to be tendered by the prosecutor, saying that they were all charged on the offence of conspiracy, which is count one of the charges. The lawyers also argued that if the court admits the documents, it would have negative impact on their clients. Upon the submission made by the lawyers, the prosecutor pleaded with the court to expunge the name of Dudafa, Briggs and Bolodeoku from count one of the charges, a request that was granted by the judge who, thereafter, admitted the documents sought to be tendered by the prosecutor. The prosecutor then urged the court to pronounce the four companies guilty as charged by the anti-graft agency. Before pronouncing the companies guilty, the court asked the directors if they agreed with the facts reviewed by the prosecutor, and they all stated that they did. Consequently, Justice Kuewumi pronounced all the four companies guilty as charged, but he declined to pronounce sentence on them, saying that will be determined at the conclusion of trial of other accused persons in the matter. He then adjourned the case till December 16, for the continuation of trial of the three other defendants.